Response Time Less than 10 Sec. Electronet series ASIONIC™ - 100 are micro-controller based 2 wire full bore type ultrasonic flow transmitters especially used for various industrial applications. These flow transmitters accurately measure the flow rate of conductive/ nonconductive liquids in closed pipes. 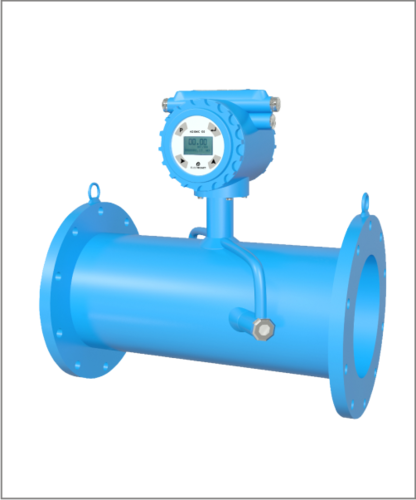 Due to its simple & rigid design, the flow transmitter is an obstruction-less & maintenance-free instrument in place of the conventional mechanical flow measuring device. The use of 'Transit time' technology offers the highest ability & better measuring accuracy in the form of electrical signal 4-20 mA DC linearly proportional to volumetric flow. "Electronet Equipments Private Limited", an ISO 9001:2015 Certified company established in the year 1993, is counted amongst the leading manufacturers and exporters of an impeccable array of Precision Control Equipments. Impeccable products like Flow, Level, Temperature, Pressure, Analytical and water meters make up this highly asked for and acclaimed range. Its precise engineering, utilizing the finest raw materials and modern machines, as per the set industry norms, ensures its commendable functionality, unmatched accuracy and superior functional life. In addition, we also offer repairing and maintenance services to our clients. We at Electronet Equipments Private Limited, have a state-of-the-art infrastructure, equipped with various modernized machines and equipment required for the attainment of goals and objectives of the firm with NABL accreddited calibration laboratory. Upgraded on a regular basis, the facility helps us in maintaining and improving our market share. To manage the firm in a better and in a more precise manner, the facility has been parted into several highly operational units. 12000 Sq Ft and 44000 Sq Ft facilites are supervised by experienced managers, work dedicatedly to maximize the firm's production capacity and standard of quality of our products. In addition, our abidance by the industry norms and working in an ethical manner, have helped us generate a huge client base. We also export in Australia, Indonesia, Malaysia, UAE, Thailand, Egypt, Romania, Kuwait, Bangladesh, Japan.